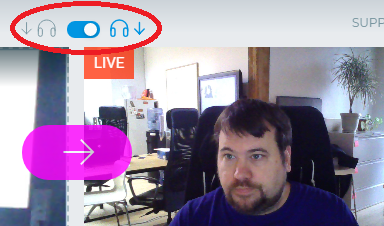 How to know when I'm live / What do the headphone icons represent? The Live Monitor is the screen in the upper right of the STAGE TEN studio that is allows you to watch what is being broadcast. Once you build your scene in the Scene Builder, and hit the Pink Go Live button, your scene will move to the Live Monitor. 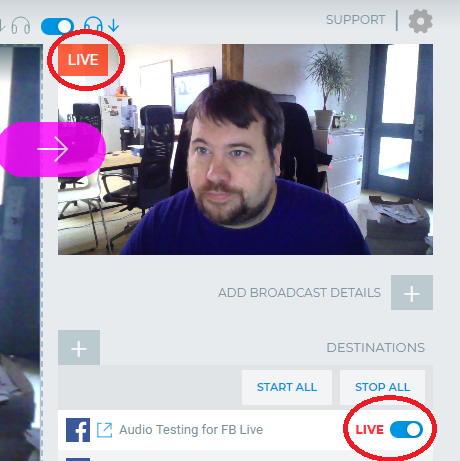 Also note, if you have a Creator +, Creator Pro, or Enterprise plan, you can create broadcasts without going live to a social platform and then access the recording (this would be a 'Live to Tape' broadcast). You can download your recording by selecting the gear/settings icon and then select Recordings. What do those little headphones represent? This toggle is used to control which screen (the Scene Builder or Live Monitor) you as the director listen to. You can manually switch this toggle. The main reason to do this is to listen to something in the Scene Builder (as a preview) before taking it live.